With animated GIFs being shared at such an increasing rate all over social media, you have to wonder where everyone is getting them from. Some kind of GIF search engine or something? That's precisely true! Giphy is the ultimate search engine specifically made for helping you find GIFs. And even though there are lots of different places you can look to find great GIFs, Giphy has quickly grown into arguably the best resource out there. 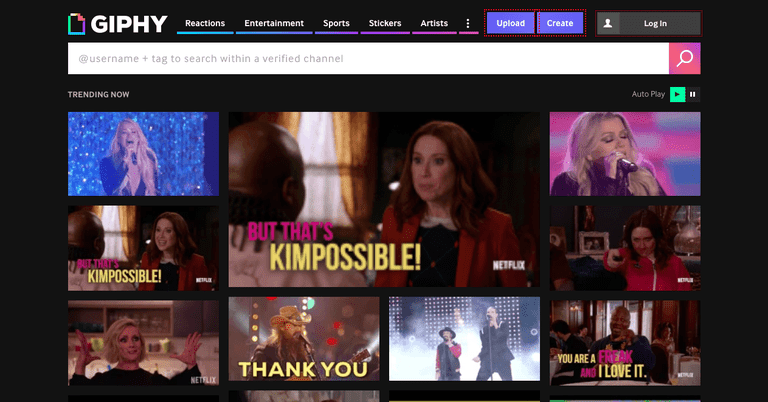 Giphy collects great GIF content based on popular GIFs and search terms across the web, then organizes it so users can easily find the ones they need. Giphy also features GIFs from favorite talented artists and brand partners. On the front page of their website, you should see a huge search bar with a bunch of GIFs underneath it. These are featured trending GIFs that are popular at the moment, and you an roll your mouse over any of them to trigger it to start playing. If you've already got a keyword or a hashtag or a search term in mind, the fastest way to get results would be to use the big search bar on Giphy, just like how you would use Google to search for something, in order to find some results. The search bar has an auto-complete functionality to suggest related terms to whatever you started typing. Reactions: Lots of people use GIFs to represent their reactions to something online, and these are commonly referred to as reaction GIFs. This section shows popular GIFs that perfectly capture the emotional reaction you're trying to communicate, like an eye roll, an LOL moment, a shrug or a facepalm. Categories: Sometimes it's not a reaction you're looking for. Maybe you need a GIF of a specific celebrity or a favorite TV show you love to watch. You can use the categories page to look through collections of GIFs organized by these types of themes. Artists: The artist's page is where Giphy features its most beloved creative artists who specifically draw and animate GIF content. You can find a lot of drawings, cartoons, computer animations and graphic design content in this section. Hot 100: This section is a special page for Giphy's top 100 most popular GIFs. These are the GIFs that are currently getting the most action most likely in terms of being shared all over the place online. Favorites: Giphy gives you the opportunity to connect your Facebook account so you can save specific GIFs as your favorites. This is a handy tool if you're interested in building up a collection, or need to save certain GIFs to come back to and use later. Lucky for you, Giphy has made it super easy to be able to share any GIF online -- particularly on social media. Click on any GIF message to be taken to its page, and you should see a number of sharing options beneath it. Facebook: Click the Facebook button to automatically post it on Facebook. Twitter: Click the Twitter button to automatically share it in a tweet. Embed: Click the Embed button to grab the piece of code you can use to easily embed the GIF into any blog or website. Shorten: You can use this to paste the URL of any GIF image and have it turned into a shorter version for easier and cleaner sharing. Link icon: Click the link icon to automatically copy the link. On the side, you'll see some related GIFs to the one you're currently viewing. At the bottom, a short list of hashtags is available, which you can click on to explore even more related GIFs. If you need to know the details about any GIF, you can find more information about it at the very bottom of the page, including its source, dimensions, size and number of frames used. To start creating your own GIFs easily in just minutes, check out this list of free GIF maker apps for iPhone and Android, or take a look at these free online GIF maker tools.